I have been eyeing up a Samsung 8000 series T.V since last year and since the only discount that was applied was around £200 from release till the the C model was EOL with the new D series, it made me selfishly unhappy that other people knew this was a great T.V. The T.V comes in 2 main parts: the T.V itself and the stand. Putting the T.V onto the stand was a fairly simply task. Whilst it can be done as a one man task, 2 is definitely recommended. 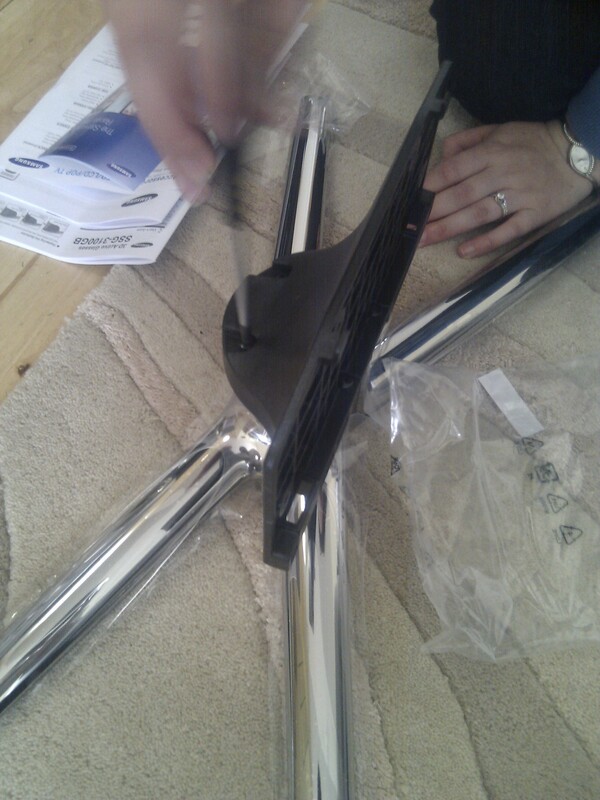 The stand is in 2 parts and must be assembled before putting the T.V on. Fixing consists of screws which are supplied but require Philips screw drivers. Once the T.V is slotted onto the stand, it can be left on without support but again this is not recommended. The T.v can swivel on the stand and it’s very stiff. So stiff that you would need to hold the stand down so that it doesn’t rotate with the panel. The Samsung T.V comes with a variety of connections main located at the rear and side of the unit, towards the left hand side when the rear is facing you (right hand side when looking at the D8000 from the front). USB and HDMI are full sized ports but some older ports must use a special Samsung adapter. I do not like the idea of having proprietary connectors but the unit is so thin it may be hard to mount a full sized SCART connector with enough strength. The composite cable was very confusing to hook up. 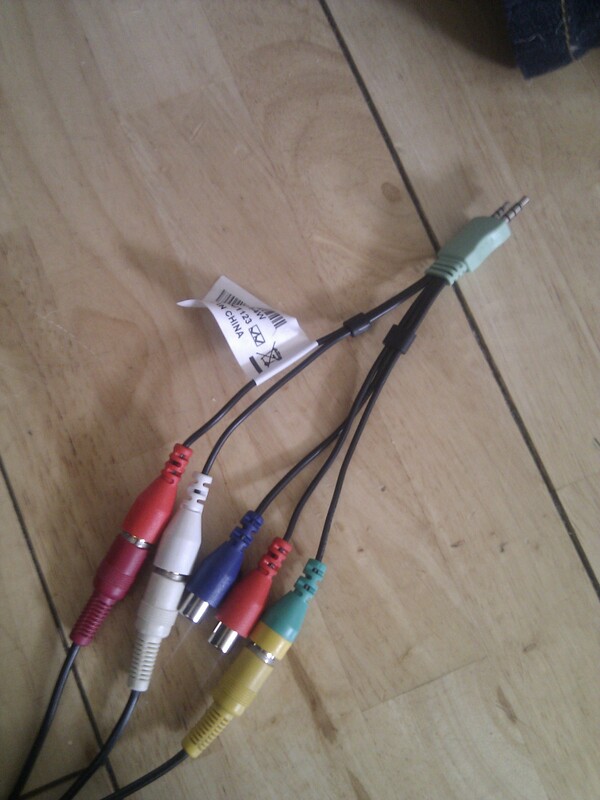 The same adapter is used for component video but the adapter has 2 red ends. The manual is black and white so it didn’t help and also the manual doesn’t even separate out the cables like the real cable. You can see in the above picture how I connected the cables together. The composite cable was used by the Nintendo Wii. The setup process was very simple and clear. 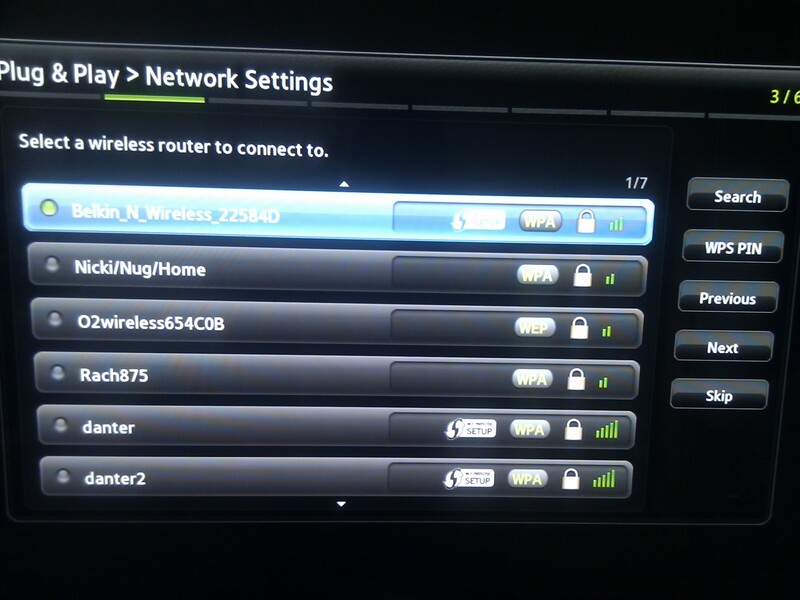 During the setup process, I was surprised and shocked that it had built in Wifi! I still opted for the wired option because I had one there and connected. Everything worked out of the box except for tuning channels because we didn’t have the ariel cable set up. Everything we watch is through Sky. The T.V comes with Consumer Electronics Control (CEC) which allows commands to be sent via HDMI. In the Sony T.V we had before it was called Sony Sync. Samsung calls this feature Anynet+. It allows the devices to send commands to one another such as remote control keys (like volume) from one device will pass it on to the other device. One of the best uses of CEC is turning the D8000 on also turns on the Onkyo Receiver on as well and also works by turning it off (to standby). The 508 works with the Samsung T.V. The volume, on/off, pass through all works together. Whilst the volume controls from either remote turns the sound up or down on the Onkyo, the volume it reports back by the T.V OSD is 10 points above what Onkyo says it is. I could not find a way to turn off the Samsung volume OSD which appears on top of the Onkyo’s inbuilt volume OSD. Also the Samsung volume OSD flickers between 2 OSD. First saying Anynet+ then disappears and then displays the volume in numbers which causes the flicker. I prefer the Onkyo volume OSD because it has a volume level bar and value shown at the same time. Also the Anynet+ OSD is usually 10 units off the Onkyo volume reading. A huge issue I have encountered is when the T.V is switched on it powers up the receiver from standby and after a few seconds it changes the input from what ever was selected before(usually cble/sat) to TV/CD. This is very frustrating because it means every time the T.V is turned on, you need to use the Onkyo remote to change the input selector. I have looked online and can confirm it’s the Samsung T.V doing it and not an Onkyo problem. The issue has persisted from the previous model (C8000). This leads me to believe Samsung will not fix it and the change in input is probably aimed at a Samsung receiver. There is no option to disable this without turning off Anynet+ (which defeats the object of not using the receiver remote). I have also tried using the non-ARC HDMI port (any HDMI port except for 2), resetting Anynet+ and setting the input of Sky (the most used input) from cble/sat to TV/CD. The latter method worked but the sound goes out of sync even with lipsync turned on and other sound oddities like multi-channel goes funny or the sound fades on certain sound frequencies. The last solution I found was to use a universal programmable remote such as Logitech’s Harmony remote controls but I think this is a workaround more than a fix. Also these remotes are not cheap (especially if you have just bought this T.V). The apps are a good concept and offer some enhanced features otherwise would be delegated to the Xbox or PS3. The 46D8000 has 1GB of memory (around 900mb usable) for apps which include Lovefilm, weather, stocks, Twitter, Facebook, etc. There are plenty of apps to download from. Since using the T.V I have not really used them after trying them out but I don’t have a Lovefilm streaming subscription. The glasses that were included with the D8000 were the SSG-3100GB. They are big and bulky but they were also comfortable. They were a good pair of stock glasses using a CR2035 flat watch like battery. Sync with the T.V was tricky. If the Samsung T.V wasn’t in 3D mode the glasses will not connect to the T.V. Also the glasses are very fragile. I managed to drop the SSG-3100GB from around waist height whilst I was putting them back into the foam sheet cloth that came with the glasses and the lense cracked, rendering them useless. Before trying the 3D I had read it was not as good as what you’d see in the cinema. This set my expectation lower and after watching Gnomeo & Juliet the Internet wasn’t even half right. The 3D doesn’t pop out and almost hit you like the cinema but more like pops out of the T.V slightly. The Sky controller T.V buttons stopped working after the switch from the Sony KDL32W5000. The volume buttons were the most frequently used keys. 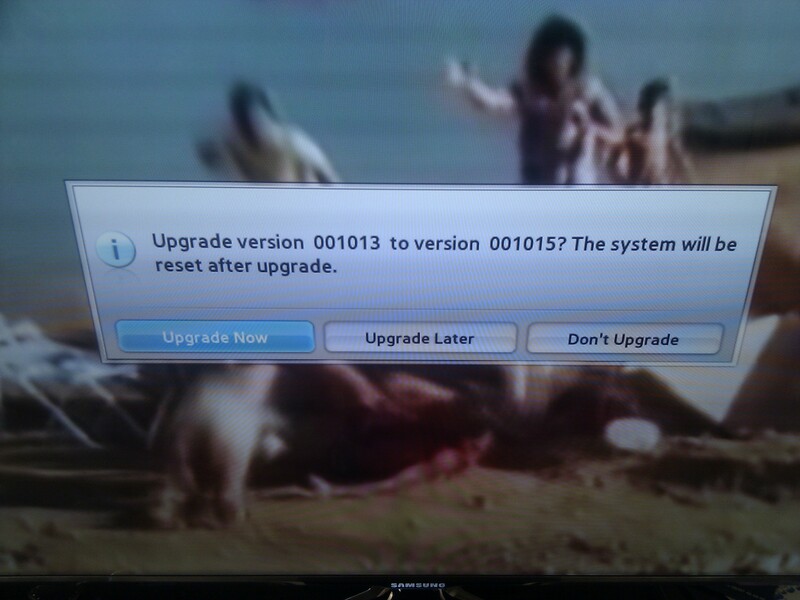 To fix this issue the Sky remote T.V code must be changed. To change Sky code to 1340. Sky has a code look up page found here. I tried to use the Sky Active service but it didn’t list the T.V model. The remote control revision number should be printed on a label on the back of the battery cover which says SkyHD rev.xR on the second line and where x is the revision number. Updates are checked automatically and a message box appears when a new one is found. The T.V is a big upgrade from my 32W5000 Sony Bravia T.V The options and features included go above and beyond what I was use to. Once you’re use to looking at thin bezel even computer monitors seem to have an unnecessary thick plastic boarder around them. The 3D was more or less useless in my opinion because it doesn’t have the depth that a cinema screen gives and there’s hardly any content current that require the technology. TX-SR508 keeps resetting input – HDMI-CEC problem? I.T software professional always studying and applying the knowledge gained and one way of doing this is to blog. Danny also has participates in a part time project called Energy@Home [http://code.google.com/p/energyathome/] for monitoring energy usage on a premise. Dedicated to I.T since studying pure Information Technology since the age of 16, Danny Tsang working in the field that he has aimed for since leaving school. View all posts by Danny →	This entry was posted in Review, T.V and tagged 8000, ARC, d series, HDMI, HDMI-CEC, Logitech, Nintendo, nintendo wii, Onkyo, Philips, samsung, samsung 8000, SCART, Sky, Sony, T.V, TS-SR, USB. Bookmark the permalink. I say if you’re going to get a TV, try to get the biggest and best. Samsung’s D8000 series TVs are fantastic! I have a 65” D8000 version and it is fantastic. The thin bezel makes the picture look as if it is floating on my wall! Since the TV can connect to the internet, I am able to go on Facebook and YouTube… which makes it even harder to get out of bed on my day off. The sound and picture are perfect though, especially with my subscription to DISH Network HD. Many of my providers in the past had HD, but not like DISH. Even if I wasn’t working for them, I would be a subscriber. Their HD is perfect for the TV, and the TV is perfect for me! There are many different TV’s you can choose from, but none are as beautiful as Samsung TV’s! It has the volume problem as well but only watching things in certain codec / listening modes. The general fail safe modes that do not suffer from this are Mono, Stereo, Direct and All channels as far as I can remember. Onkyo support sent me a link on another issue before which was out of date and did not solve the issue. I replied again stating that fact and have not heard from them since. The volume issue can be temporarily fixed by raising the volume and eventually the sub will pop and the sound level will come back at which point you can lower the volume back to how you had it until it happens again. If I started again I would not buy the TX-SR508 or possibily an Onkyo branded receiver again because there are more established A/V manufacturers than Onkyo however Samsung are one or the industry leading T.V panel manufacturers currently.